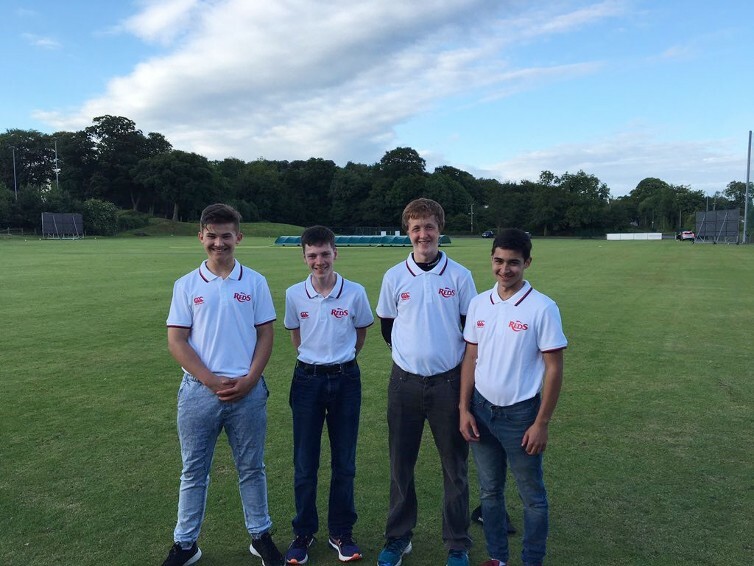 On a wet day in Saintfield CC, the Southern XI U15’s produced the biggest upset in recent times of interprovincial cricket as they stunned Leinster U15’s, winning by 21 runs (D/L). The Southern XI team which was only chosen last week and made up of a mixture of Munster U15’s and younger Leinster U15’s, dominated Leinster with both bat and ball to record their famous victory. The day started like all inter-pro days did, early and as we made our way up the M50, little could we expect what lay ahead. Both the weather and the forecast were dire, with Met Eireann keeping us reminded of the constant showers we could expect to experience in Ulster. Still, we drove on as optimistically as all good Munster supporters do. We arrived at the ground with the covers still firmly in place and the prospect of play bleak. As the rain poured down, locals pointed to clearer skies from the south, optimistic that some play would be had. By half one the decision of an early lunch was taken with the hope of making up for some of the lost time. A three pm restart was the target with the match reduced to 33 overs. The Southern XI were dealt an early blow just before the toss when unfortunately Munster star Diarmuid Carey, was ruled out of the match due to an illness. The game continued however and Leinster won the toss and to no one’s surprise decided to have a bowl. With the pitch under cover for most of the previous 24 hours, neither camp was too sure how it would behave. Munster’s Kasim Alam Baloch and Leinster’s Justin Martin Kavanagh opened the batting for Munster and initially looked in control against the opening bowlers, Both defended and drove nicely, just struggling to pierce the tight Leinster ring. Alam Baloch timed one sweetly for 4 down the ground but very soon after was the first man out, having his off peg knocked off by a peach from O’Reilly for 7. This gave the Leinster bowlers some confidence and tidy spells followed from the Leinster quicks. This mixed with the up and down nature of the pitch kept the southern XI run rate low and pressure built. The Southern XI were the first to crack as new man McGuire drove hard and was spectacularly caught and bowled by Jackson. Spin was first introduced in the 10th over and straight away had an impact as the ball started to rip majorly almost immediately. Leinster nearly had their third wicket as a ball from Garth bounced a little and was spooned up in the air, it landed safe between three fielders but the Southern XI batsmen were caught ball watching and Martin Kavanagh was nearly run out at the keepers end. This ball provided plenty of entertainment to fans but thanks to the joys of cricket, only a single went on the scorecard. The overs kept ticking along and the southern XI struggled to keep their run rate above three. The batsmen started to take a couple of risks and some nice shots were hit over the bowlers head for 4. However their luck ran out and O Halloran was caught at mid-off trying to create some room for himself. Two balls later Jackson had his third and Leinster’s fourth as he caught and bowled another to remove the southern XI captain MacKay for a duck. The middle overs continued to progress at a slow rate for the southern XI and when Ruttle accounted for Martin Kavanagh (for a well made 33) and Johns for a duck, the Southern XI languished at 60 for 6 off 19 overs. This brought Munster duo Whitaker and Jones together and slowly but surely they built the partnership of the match. Whitaker started the brighter and hit powerfully through the offside, the slow outfield preventing some otherwise certain boundaries. From the other end Jones hit cleanly straight and hit the only 6 of the innings with a sweet strike over mid-on. Unfortunately Whitaker was run out after a mix up on 29, but Jones ploughed on, his highlight a perfect switch hit for 4 through the vacant cover region. Unfortunately rain returned to ruin his fun and enough time was lost for the southern XI innings to finish on 124-7 off 29 overs, Jones unbeaten on 33. The rain delay allowed the umpires and scorers to have their fun in calculating a Duckworth Lewis target. Eventually they agreed on the Leinster target of 135 off 29 overs, not the most challenging target but enough to send a few nerves through the Leinster dressing room. The Southern XI knew that they had to strike early and that they did, opening bowler McNulty having both the openers back in the shed without having progressed the score beyond 12. Southern XI opened with spin at the other end and a mixture of cautious batting and heroic fielding, allowed the Leinster batsmen to only reach 25-2 off 11 overs. Jones and Oliver Woods were the change bowlers and followed the openers lead, with more tight work. Overs suddenly seemed to start passing the Leinster batsmen by and when Oliver Woods accounted for Archer, Leinster were 26-3, with 109 required off 106. Panic was starting to spread through the whole Leinster squad and their normally loud and supportive playing and coaching unit, fell silent as they realised that the Southern XI weren’t the pushover they anticipated. The Leinster players showed they were up for the fight however and Garth started the fightback with a big straight 6 off the spinner. Boundaries were hard to come by as the Southern XI scavenged for every run in the field, putting their heart and body on the line for every ball. Their work was rewarded as they gained the home support, the clubmen of Saintfield CC started egging on the under dogs. After 15 overs the game was in the balance, Leinster required 88 off 84 balls with 7 wickets in hand. Whitaker was introduced for the Southern XI and immediately had an impact, removing the dangerous Hoey for 24 and soon after Garth followed for 19. The former well caught at point by Alam Baloch. This brought De Klerk to the crease and he immediately found his range, hitting a couple of big 6’s to bring leinster back into the game. At the other end, the injured Rock ran hard for 2’s with his partner and mixed with a couple of missed run out opportunities, the equation was brought down to 49 off 46. The game was in the balance and it was the retuning spinner Hussain who dealt the killer blow, having the dangerous De Klerk caught at short fine leg for 22. By this stage the ground was drenched in the evening sun and suddenly the southern XI were in the ascendancy but Thomson came in and found the gaps from ball one. He picked up a lot of 2’s and kept his team in the game. Hussain then struck, pushing a quicker ball onto Rocks’s stumps. From there the flood gates opened for the southern XI, the last 3 wickets falling for 7 runs. This included two run outs, one to Alam Baloch and the match ended with a direct hit from Jones to bowl Leinster out for 114, a loss of 21 runs (D/L). Jubilant scenes were everywhere to be seen at the end as the Southern XI celebrated an historic victory over their neighbouring rivals. The joy wasn’t just reserved to the players, certain coaches and parents were unable to hide their emotions at the very end. As darkness fell over Saintfield CC, the Leinster team were left rueing their most surprising loss in recent memory, while the the Southern XI side celebrated their famous victory and began preparing themselves for a shot at the title that has been dominated by Leinster for so many years. For the fans of munster cricket, today was just reward for so many years of suffering. Leinster, for so many years the unbeatable, for one day, the defeated. View the full scorecard on CricHQ by clicking here.